I recently discovered a great product and one that I most certainly need! It's the Zippo Candle Lighter and I love mine. I never really thought about how fantastic a candle lighter could be, but I do have to say that this one is pretty special. Of course, the cute design doesn't hurt. I have the red snowflake one pictured below. Let me give you a little background on why this product is so relevant for me. I am being inundated with candles. Every year, Booking Daughter sells candles for her dance studio. We are asked to buy 5 at $15 each. Yes -- that's $75 above and beyond the cost of her regular dance classes. And then, Booking Daughter comes home the next week with another fund raiser for her drama department. Guess what for? Yep - candles again! This time I was asked to buy 10 at $10 each. Now if you're anything like me when it comes to buying candles (or even if you're not so lucky), then I definitely recommend the Zippo Candle Lighter. These fashionable lighters come in four solid colors (Cabernet, Pink, Sea foam, and Pearl) as well as four patterned designs (Snowflake, Asian Floral, Cheetah, and Patriotic.) They have one that is guaranteed to suit everyone's tastes. These candle lighters make the perfect stocking stuffer by themselves or even a great gift when paired with a candle. The patterned lighters are available in a very cute package that looks like a purse. This small "clutch" resembles faux black alligator skin and even has a cute little handle. Zippo Candle Lighters are priced between $14.95 and $19.99 and can fit into everyone's budget this holiday season. Thanks to Zippo for providing me with a sample lighter. Giveaway alert: Would you like to win a Zippo Candle Lighter of your choice for either yourself or someone special? Check out the different styles here and pick your favorite. Then, come back and fill out the form below before November 30th at 11:59 p.m. ET. I will randomly select and notify the winner the following day. This contest is open to those of you with U.S. addresses only. Good luck! I use something similar to this, but it's not made by Zippo. Thanks for the great giveaway! 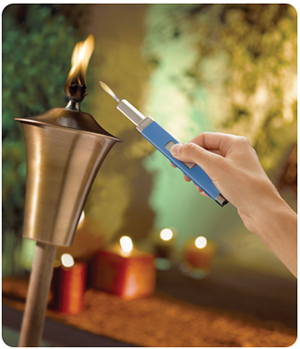 For candle users, I couldn't get by without the product called Candle Wax Lifter by Goo Gone. It is fantabulous! Great idea. You overload of candles story is too funny. Thanks for hosting.